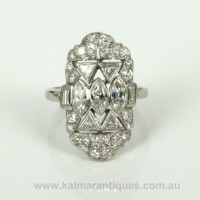 Product code: ES3547 Categories: Art Deco, Art Deco Rings & Art Deco Engagement Rings. When Howard Carter discovered King Tutankhamun’s tomb in 1922 it not only sent shock waves around the world with what was discovered but coincided at the most perfect time- the Art Deco period. The Art Deco period started after World War One and was an era of decadence with fabulous jewellery being created in designs never before seen and after King Tutankhamun’s discover resulted in a style of Art Deco jewellery often called “Egyptian Revival” which can be seen in this Art Deco diamond ring. Art Deco jewellery is often very geometric and this ring displays this in not only its designs but also the cut of diamonds as well. 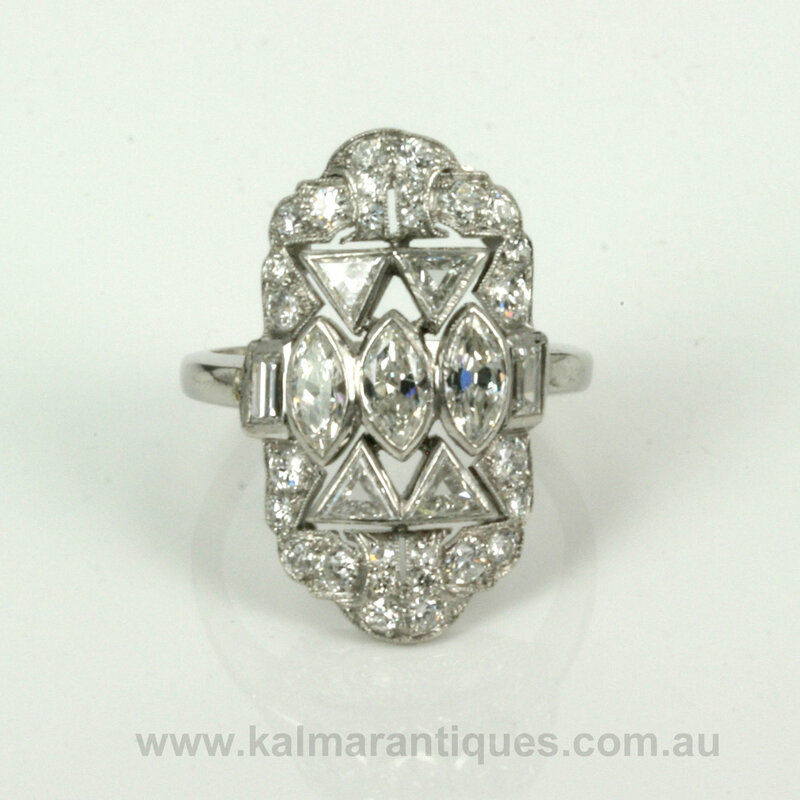 All hand made in platinum around 1925, the ring is set with a total of 37 diamonds. In the ring, there are a combination of different cut diamonds with 4 triangular cut diamonds, 3 marquise cut diamonds, 2 baguette cut diamonds and 28 semi-modern round cut diamonds. These diamonds have a total weight of 1.75 carats and are very white F colour diamonds and are Vs to si in clarity. The ring measures 15.4mm wide from baguette cut diamond to baguette cut diamond, by 25.3mm in length and sits so well on the finger. Art Deco jewellery is so special and unique, and this diamond ring has all the charm of this wonderful era.